Paul Macneil (1883-1964) practiced in the Copper Country for about seven years, but in that short time he designed one of the area’s most famous buildings. Daily Mining Gazette, 5 August 1905. Search for your Ancestors, Ancestry Library Edition, 19 March 2006. 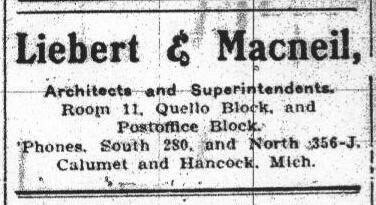 Leibert & Macneil mentioned in Daily Mining Gazette, 5 August 1905, and ad 19 August 1905. Polk Directory, 1910. Daily Mining Gazette 16 December 1905. Evening Copper Journal, 20 October 1909, and Gundlach Collection, 85V. Fourteenth Census of the United States, Ancestry Library Edition, 19 March 2006.